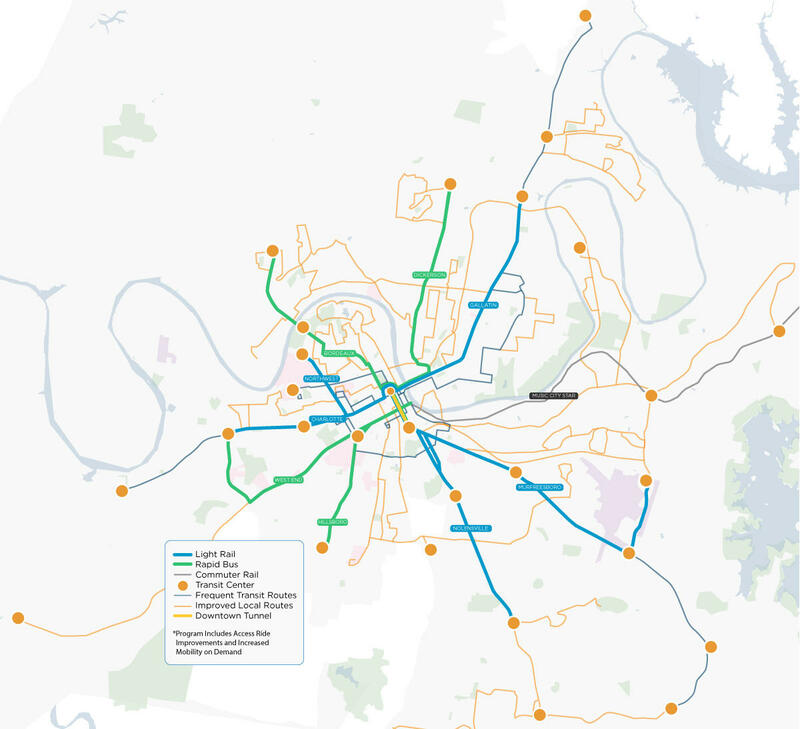 A revised mass transit proposal would extend light rail service along Charlotte Avenue from downtown Nashville to White Bridge Pike. The revised proposal, announced Wednesday, would take rail service 2 miles farther west to White Bridge Pike — touching the booming neighborhoods of Sylvan Park and The Nations, plus several major mixed-use developments. The administration had cited cost for keeping the line shorter, but has since revised its financing plan, crediting stronger forecasts for sales tax revenues from facilities like the Music City Center and First Tennessee Park. The overall cost of a 5.2-mile Charlotte line would be $697 million, up from the shorter route at $457 million. The change also now matches the recommendation in the nMotion strategic plan (more about light rail here), which called for transit to serve the corridor’s density of housing and jobs. Two area council members who had been critical now say they’re in favor of the mayor’s plan, which heads to a likely public referendum in May. This revised map shows extended light rail (thick blue line) along Charlotte Avenue in West Nashville. In some respects, Nashville’s Charlotte Avenue is a prime example of what not to do to create a walkable, vibrant corridor. That’s the message delivered in a yearlong study by researchers with the Urban Land Institute. The group has ideas to guide the street’s growth and rapid transformation, perhaps as a template to use citywide.